Our CEO, Rajan, works remotely. 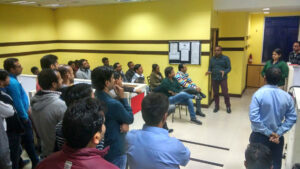 When he visits us in Chandigarh, he spends an afternoon fielding questions from employees during an open house session. During this trip, he elaborated on our strategy and goals for the coming year and how Safaltek will be supporting continuous learning for its employees.